The BRUTE is a step ahead of the rest! 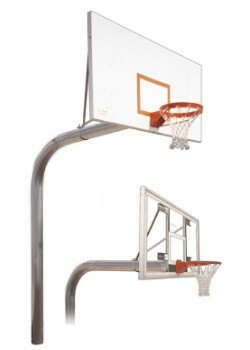 First Team�s Brute basketball system is a massive 5 9/16" diameter galvanized post and outstanding 72� overhang playground basketball system. First Team has incorporated its easy to install nosecone into the Brute pole structure design. This makes installing the backboard much easier, minimizing backboard lifting when installing the backboard. The Brute is INDESTRUCTIBLE and First Team backs it with our SUPERIOR LIFETIME WARRANTY! So why let your basketball court be run down by other systems that can�t hold up? Let First Team show you the true meaning of reliability and toughness with the Brute!